Lorain Community College is recognized as the first Community College Society of Women Engineers Affiliate in the US. For more information, contact Ramona at ranand@lorainccc.edu or 440-366-4930. The ASVAB (Armed Services Vocational Aptitude Battery-Career Exploration Program) test is a helpful tool in measuring strength and potential for success. It is designed to match skill sets and interests with declaring a major, and helps in developing an action plan for success, and exploring different career options. or 12:30 – 2 p.m. If the student is under 18 years of age on March 30, 2018 Please have a parent or legal guardian complete this form. Check the box below if student is under 18 years old and has parent consent. 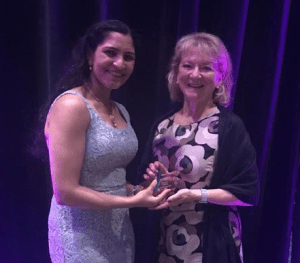 Ramona Anand, Society of Women Engineer Founding Advisor at LCCC received the Engaged Advocate Award from SWE President Penny Wirsing on Saturday, February 16, 2019 at the Society of Women Engineers conference in Tampa, Florida. 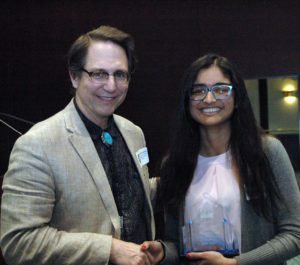 The Engaged Advocate Award honors individuals who have contributed to the advancement or acceptance of women in engineering. Ramona Anand receives Engaged Advocate Award from SWE President Penny Wirsing. Watch the interview with LCCC and ECHS student Eleana Cintron on WKYC. Some members of LCCC’s SWE program are featured in the online newsletter “SWEet Wisdom” from the Society of Women Engineers. They share advice for high school girls making decisions about college. Society of Women Engineers Collegiate Interest group at Lorain County Community College received SWE Mission Bronze award on October 20, 2018 at WE 18, held in Minneapolis, MN. LCCC was the first community college to receive this international award, and is the first to receive it two years in a row. 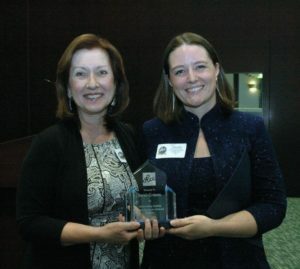 SWE Mission Awards recognize groups that embody SWE core values and demonstrate continuous improvement and growth as they work to achieve the Society’s strategic goals. 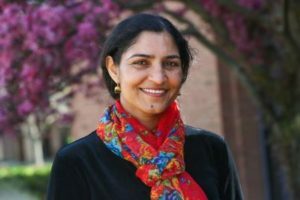 Ramona Anand, Faculty Adviser, received Region G Advancing Leader Award at the Society of Women Engineers Regional Conference at Carnegie Melon University, Pittsburgh on Feb. 18, 2017. Region G is comprised of four states Ohio, Kentucky, West Virginia and Pennsylvania, including 32 collegiate sections and six professional sections. The Region G Advancing Leader Award is given to individual collegiate and/or professional who has been actively engaged in an engineering or technology degree, has demonstrated outstanding technical excellence, and has consistently engaged with SWE. The award includes cash grants based on funds and a certificate accompanied by the award distributed at the discretion of the Region G conference. SWE’s education and outreach activities are designed to enhance the quality of life for women of all backgrounds who pursue the profession of engineering. 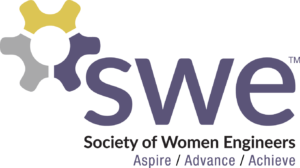 SWE Magazine—the Society’s award-winning magazine, covering issues of interest to women engineers including the achievements of women engineers, career development, career guidance, activities within the Society, and technical topics. All Together, SWE’s monthly newsletter. Outreach programs that encourage girls to pursue careers in engineering through SWE’s alliances with Girls Inc., Girl Scouts, and US FIRST (Foundation for the Inspiration and Recognition of Science and Technology. For more information, contact Ramona at ranand@lorainccc.edu or call 440-366-4930. Get all the benefits of membership without paying a membership fee.